Click the "Restore Data" command on the File menu. The Restore window enables recovery of data from a previous backup. Data can be backed up manually, or configured to automatically backup, using the Backup Data command on the File menu. The backup and restore feature can also be used to transfer data from one computer to another. For example, if you get a new computer and would like to move all your VueMinder data from your old computer to the new one, use the "Backup Data" command on the old computer. On the Backup Data window, click the "Backup" button to generate a backup file. Copy this file to the new computer and use the "Restore Data" command. Click the "Browse" and then select the backup file. VueMinder will restore from the backup and restart. Using this method, an exact replica of all your data and settings will be transferred. 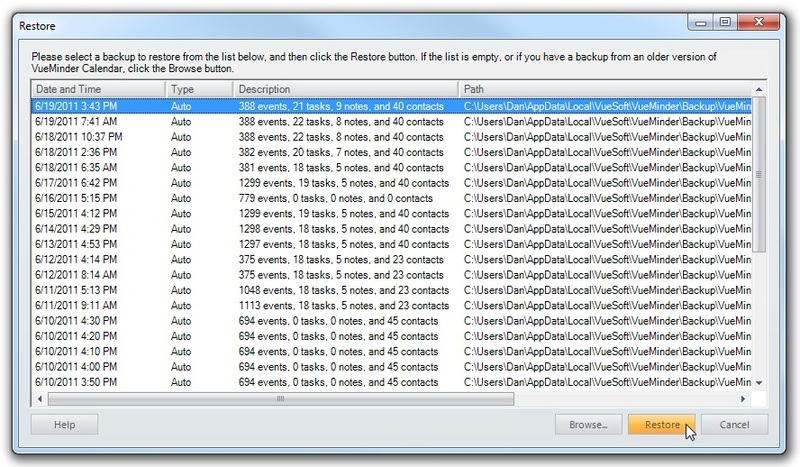 The Restore Data window will list all the previous backups, both ones that were performed manually or automatically. The number of events, tasks, notes, and contacts present in each backup will also be shown, along with the location of the backup file and the date/time it was created. To restore from a backup, click the desired row and then click the Restore button. VueMinder may need to restart to complete the restore. 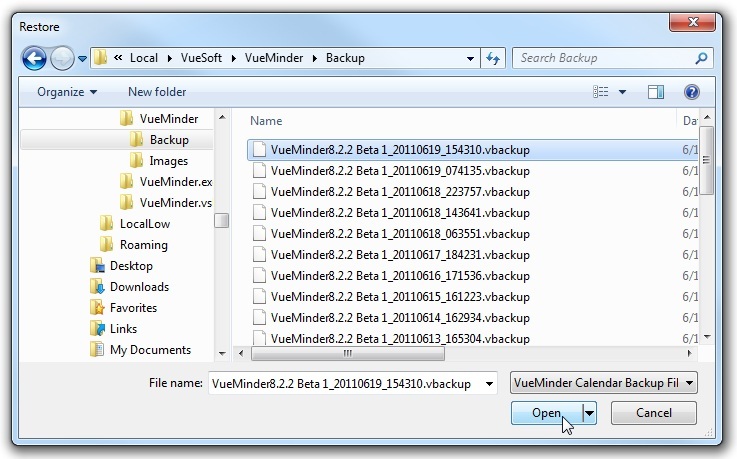 You might have a backup file that is not listed, which can happen if a backup is generated on a different computer or if all of VueMinder's data is lost including the backup checkpoint history. To restore from a file, click the Browse button and then open the file. Backup files generated using version 7.2 or later will end with a vbackup extension. You can also recover data from versions prior to 7.2 when selecting the file named CalendarInfo.bin.